Erin Pankratz has been honing her intuitive understanding of colour since her childhood in the Northwest Territories. Erin trained as a ballet dancer till 1994, and then attended Alberta College of Art and Design. In 2011 she created a large mosaic mural for the Edmonton International Airport. 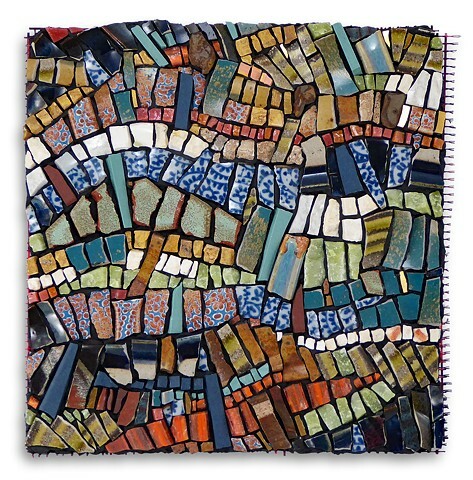 In 2013 and 2016 Erin received the Innovation in Mosaics Award for the juried group exhibition Mosaic Arts International. She has created mosaic for public, and private clients, and continues to build a robust body of personal work that pushes colour boundaries and blurs the lines between the traditional elements of mosaic: substrate, adhesive, and tesserae. Creative specialties: contemporary mosaic, residential/commercial commissions, public art, and murals.